Critically-acclaimed international megastar Bruno Mars has unveiled today his first piece of solo music in nearly four years. 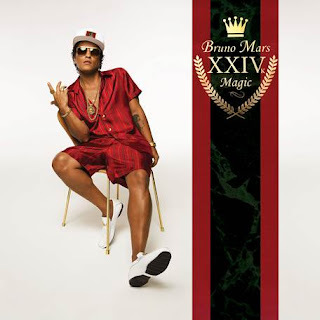 Written and produced by Shampoo Press & Curl, “24K Magic” (pronounced twenty-four karat magic) sees Bruno bringing the bounce to his newest single, which is now available for streaming and download at all DSPs. The multi-GRAMMY-winning Mars has also announced his highly-anticipated third studio album - also dubbed 24K Magic - will arrive everywhere November 18th. “24k Magic” is accompanied by a brand new music video directed by Bruno Mars and longtime collaborator Cameron Duddy. The clip - complete with jet skis being ridden through the famous Fountains of Bellagio - is streaming now at Mars’ official YouTube Channel: http://smarturl.it/24kmagicvideo. The two-time Super Bowl Half Time Show veteran performer will return to SATURDAY NIGHT LIVE for his fourth appearance next Saturday, October 15th. Bruno Mars is a 20-time Grammy Award nominee and multi-Grammy winner. The critically acclaimed singer, songwriter, producer, musician has sold over 169 million singles worldwide, making him one of the best-selling artists of all time. Mars most recently dominated charts with hit single “Uptown Funk.” The worldwide smash is the longest-leading Billboard Hot 100 single of the 2010s, and is only the 10th single in the Hot 100’s 57-year history to spend at least 14 weeks at Number 1. “Uptown Funk” took home 3 GRAMMY Awards this past year, including the coveted Record of the Year award. The companion video for the hit single was also nominated for five MTV Video Music Awards in 2015, winning the award for Best Male Video. This past February, Bruno Mars returned to the Super Bowl Halftime stage to perform alongside Beyoncé and Coldplay at the Super Bowl 50 Halftime Show. In 2014, Bruno Mars made NFL history with the second most watched Super Bowl Halftime Show, which saw a record breaking total viewership of over 115.3 million, all while being the youngest artist ever to serve as the sole NFL Super Bowl Halftime headliner. According to Billboard, Bruno Mars scored his first five “Hot 100” No. 1s faster than any male since Elvis Presley. As a singer, songwriter and producer, Bruno Mars has an impressive catalog of 22 “Hot 100” hits.